One of the students in the Fern Creek Traditional High School's "Unleashing Digital Storytelling" class edits video. “I feel like a trailblazer Mr. Barnwell!” Courtney exclaimed to me. She was a junior at Fern Creek Traditional High School in Louisville, Ky., and told me this early in the school year. She was in front of an iMac desktop, engaging in a blog debate on the usefulness of Twitter in the high school classroom. The next day, she would participate in a photo scavenger hunt on school grounds, attempting to integrate multiple photo composition rules in the images. Courtney and her classmates in her “Unleashing Digital Storytelling” class are on fire to begin the year. I’ve been developing the class over the past two-plus years at Fern Creek. The course initially emerged after I took a “New Literacies” class at Middlebury College’s Bread Loaf School of English. As a literature major, blogger, and avid reader, I’ve always appreciated storytelling, and the “New Literacies” course opened my eyes to new possibilities. 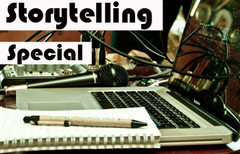 Storytelling could take new forms. Students could become the authors of their own lives in ways more relevant to their digital habitation, while still making the connection to traditional narrative structures and forms. But finding a ready-made curriculum for creative and ever-evolving storytelling with digital media — audio, photography, and video — proved difficult, so the experiment began. If we don't consider and carefully plan what skills students are learning and practicing by employing technology in the classroom, we're doing our students a disservice." The first year, we used three different classroom spaces. The course was a dumping ground for upperclassmen needing elective credit. Our equipment was back-ordered. I didn’t develop a coherent curriculum. Instead of using technology tools as a catalyst to teach storytelling, I was teaching students disjointed skills. It was a mess. We focus on storytelling and making connections between writing forms and new media. We employ technology to develop or enhance measurable skills. We are mindful consumers and producers of technology. We maximize collaboration inside and outside the school. We must be flexible and patient. Students practice interviewing skills on the patio. Technology is vital to the course, but interpersonal and face-to-face communication skills are too. Just the other day, a student approached me with her cell phone and showed me a photo she hoped to include in her first assignment, a narrative or thematic photo essay. It was a picture of her friend, face obscured by a stuffed animal. The picture represented some of the photo composition rules she had been learning, including the rule-of-thirds and using color and contrast. Not a bad image. “So how will this fit into your overall story?” I asked. “I’m not sure,” she responded. Her problem is common among my students — it’s a lot easier to capture interesting images than create compelling shots while also making sure there is a purpose behind the photo, video, or audio clip. We spend the first several weeks in in the storytelling class analyzing images for character, setting, and theme, among other traditional narrative elements, in order to strengthen the connection between literature and photography. We read short stories and annotate them for the same elements, then we break down images again. Students learn how to effectively sequence photos to develop the beginning, middle, and end of a story, and also capture and choose images that emphasize a theme. Students who really catch on quickly understand that planning a photo essay or short documentary takes a similarly arduous planning process as writing an effective essay, which sets the stage for using technology as one piece of the new media creation puzzle. No matter the subject we teach, if we don’t consider and carefully plan what skills students are learning and practicing by employing technology in the classroom, we’re doing our students a disservice. It took me awhile to figure this out. Two years ago, when placing laptops in front of students in the pilot group for the digital storytelling course, I achieved maximum engagement — engagement with Facebook, Twitter, and watching music videos on YouTube. It drove me crazy. I had provided few learning objectives, and beyond some rudimentary photo, video, and blogging skills, students honed their social media distraction abilities. They all would have earned an A+ in off-task use of technology. Student productivity and on-task time with technology — the good kind — have increased during recent installments of the class. Only a fraction of students take advantage of wireless connectivity and social media sites to check up on Chris Brown and Justin Bieber’s musings. I’ve been able to outline clear goals about how and why we’ll be using certain websites, cameras, and apps. Students have some clearly delineated learning targets to practice during class activities. For example, in order to create a strong audio slideshow, combining still images and an interview sound track, students must be able to use interpersonal skills to schedule photo shoots and interviews, apply a variety of photo composition rules, conduct and edit interviews, then log and edit their footage, among other tasks. Teaching these skills is an exciting process with a project-based outcome, but I can still measure and assess student learning along the way, just as I would with theme analysis and grammar skills in my sophomore English group. If administrators ask, “How do you know the students are learning?,” I can point to the measurable skills and inform them how Riah or Detrick is doing with regards to applying photo composition rules or sequencing images. During the opening day or two of the storytelling class, I give students a self-assessment regarding their technology use. Inevitably, many students admit they feel addicted to their phones, texting, games, and social media sites. I admit to the students I’ve caught myself checking e-mail too frequently, or reading mundane news feeds on Facebook instead of lesson planning. But I remind them that they are ultimately in control of their tech habits, and it starts with self-awareness. I challenge students to step back and reflect on why and how they use technology; otherwise, it’s too easy to become passive, distracted digital citizens. Howard Rheingold’s recent release, “Net Smart: How to Thrive Online,” provides educators and citizens alike with suggestions of digital literacy skills to practice while facing the onslaught on continuously streaming information and distraction. These skills include honing your attention, crap detection, and knowing how to effectively shape your digital footprint. I share my own personal experiences and blog posts about technology and culture with the students, engaging them in weekly debates and discussions, both online and offline. We should challenge our students to consider how their choices affect their social interactions, productivity, and attention. As Courtney stated, she felt empowered to be able to step back and think about Twitter in a critical way. Most students desire for their work to matter, to feel real, and to extend beyond the confines of our four classroom walls. In storytelling, we partner with local media producer and strategist Stephen Kertis of Kertis Creative and his employees to encourage learning outside the classroom and develop real-world context for their media work. We co-hosted the first summer media workshop at Fern Creek in 2012, with six students voluntarily returning to school the first full week after closing day — no small feat. In the course of five days, two students worked with one coach and learned what it takes to create professional-quality digital storytelling. They all put in roughly 25 hours to create a two- to three-minute presentation, a little more effort than sitting in front of a screen, using a webcam to create a monologue, then uploading it to YouTube. The class also attempts to learn from and volunteer for local non-profit organizations. Students visited Wayside Christian Mission, The Family Scholar House, and Visually Impaired Preschool Services (VIPS), meeting employees and interviewing clients about their experiences with the various groups. We also participate in video contests such as Reel Action, a campaign spearheaded by local social services organization Seven Counties. Students create public service announcements discouraging underaged drinking. New tools, apps, and websites constantly emerge. Teaching digital literacies and storytelling requires us educators to consider what is possible and also compare competing instructional tools. Before this school year began, I wanted to utilize a digital space to organize resources for students. I considered wikis and a class blog. As late as July, I hadn’t made up my mind on what to employ. I learned about livebinders over the summer during a graduate school course, and the ease of organizing a variety of files online with this site led me to believe it’d be a great tool for the class. So I set up a page. Then I learned about “Edmodo”:http://www.edmodo.com/. While I don’t use much social media in my personal life, I decided to tap into student familiarity and engagement with social media to set up pages for all digital storytelling and English classes. Like livebinders, I can upload and archive files and links for students on Edmodo, but it’s much more interactive. Students can help create content, post questions, and turn in assignments. Many students have already downloaded the mobile app. “This is the only class where I can do homework assignments on my phone,” Ryan said with a grin, iPhone in hand. Engaging with technology tools also challenges us to be patient when the technology isn’t working smoothly, which is fairly regularly. Our school wireless signal is inconsistent. Sometimes cameras malfunction. Other times, students forget Edmodo passwords and other little steps required of them to complete assignments. If you are a control freak, teaching digital literacies and storytelling is not for you. The process can be messy, you must cede control at times, and you must be ready to troubleshoot every class period. But it’s worth it. Perhaps the most exhilarating part of teaching digital storytelling is embracing the fact that there is no true roadmap. I’ve got the opportunity — along with other like-minded teachers — to embrace the challenges and intersection of technology, culture, and education with fresh ideas. Paul Barnwell teaches English and digital media at Fern Creek Traditional High School in Louisville, Ky. In his spare time, he enjoys bow hunting, urban gardening, and rooting for the New England Patriots. He is currently a student at Middlebury College’s Bread Loaf School of English. You can read more of his thoughts on education, technology, and culture on his blog.